Imagine a heart-stopping open-air free-fall, from three stories high! 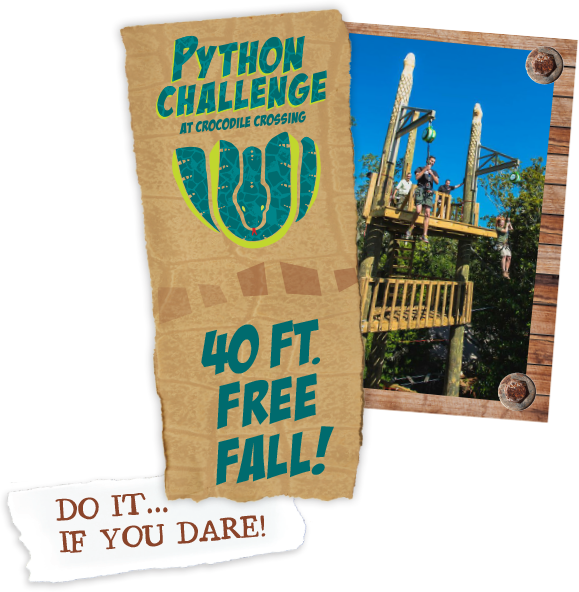 Python Challenge is a 40-foot controlled free fall adventure utilizing the newest technology in adventure challenge courses. Visitors step off the top of a custom-built platform for a heart-stopping adrenaline rush high above the canopy of The St. Augustine Alligator Farm Zoological Park. Advanced magnetic eddy current technologies provide a safe, non-jarring return to the ground. The result is a heart-stopping, soul-stirring adventure like none other! COST: $10 for one jump, $15 for three jumps and $17 for two climbs & two jumps per person. Reservations not required.